The vast majority of hearing aid wearers as well as their family members, friends, and colleagues may be all too familiar with the shrill chirp or whistle of hearing aid feedback. While this high-pitch sound may have been a planned feature of 1970s rock concerts, it can be quite intrusive and perhaps embarrassing while watching television, dining out, or attending church services. A hearing aid specialist will attest to the fact that feedback is inherent in wearing hearing aids, regardless of device style or cost. Even the most technologically-advanced forms, including those specifically designed to combat/cancel feedback noise, will whistle/chirp at times. When hearing aid feedback happens on an infrequent basis, it can merely be considered as a normal/natural occurrence; however, more consistent and/or persistent whistling could be a sign that there is something amiss with the hearing aids themselves. Without delving too deeply into the field of acoustics or the science of sound, hearing aid feedback essentially occurs when sound travelling from the microphone to the receiver leaks back to the microphone and is repeatedly amplified. This forms a sound loop that further intensifies the sound each time the cycle is completed, until it reaches the point where it becomes a high-pitched whistle/squeal. While the above might be of some benefit, they can quite often be temporary in nature, as there may be an issue with the hearing aids that will require a visit to a hearing clinic like Bravo Hearing Centre in Toronto. 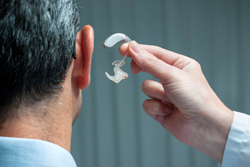 Hearing aid feedback can be unpleasant and somewhat awkward, particularly in group or social settings, but it should not preclude wearers from enjoying the benefits afforded by such devices. Those concerned about the frequency and/or persistence of feedback with their hearing aids are encouraged to consult with a specialist from Bravo Hearing Centre in Toronto at their earliest convenience. The treatment of hearing loss is much more comprehensive than simply choosing a type of hearing aid from a list of available options. In fact, hearing aids, while fundamental to revitalizing the lifestyles of many individuals with hearing impairment, are only one part of the wide-ranging services provided by the hearing specialists at Bravo Hearing Centre. 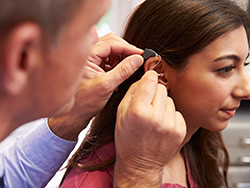 If you are experiencing persistent feedback issues with your hearing aids, a visit to our hearing clinic in Toronto would be advisable to determine both its cause and resolution. Call the hearing aid specialists from Bravo Hearing Centre at 416-207-9711 to book your appointment today.